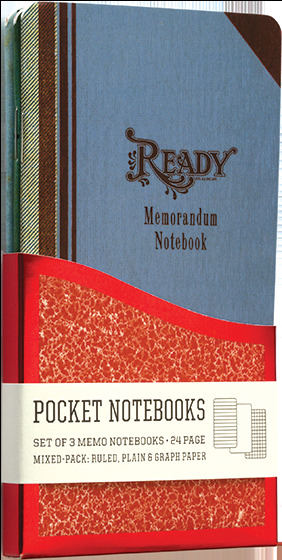 A Pack of 3 Memo Notebooks with Vintage Memorandum Journal Designs. We've always found the Receipt, Ledger, Cash and Memorandum notebooks of the past charming, with their decorated covers and leather or imitation leather corners, and so have designed these little notebooks to look like miniature Memorandum books of the past. They will inspire you to carry your to do list or your brilliant thoughts in any pocket.